This page Musicology is part of the music series. 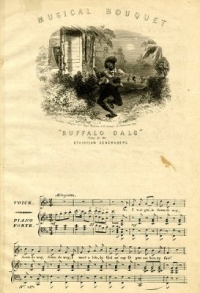 Illustration: Sheet music to "Buffalo Gals" (c. 1840), a traditional song. Maxim: "writing about music is like dancing about architecture". Musicology is the scholarly analysis and research-focused study of music. A person who studies music is a musicologist. For broad treatments, see the entry on "musicology" in Grove's dictionary, the entry on "Musikwissenschaft" in Musik in Geschichte und Gegenwart, and the classic approach of Adler (1885). In the broad definition, the parent disciplines of musicology include history; cultural studies; philosophy, aesthetics and semiotics; ethnology and cultural anthropology; archeology and prehistory; psychology and sociology; physiology and neuroscience; acoustics and psychoacoustics; and computer/information sciences and mathematics. Musicology also has two central, practically oriented subdisciplines with no parent discipline: performance practice and research, and the theory, analysis and composition of music. The disciplinary neighbors of musicology address other forms of art, performance, ritual and communication, including the history and theory of the visual and plastic arts and of architecture; linguistics, literature and theater; religion and theology; and sport. Musical knowledge and know-how are applied in medicine, education and music therapy, which may be regarded as the parent disciplines of Applied Musicology. Traditionally, historical musicology has been considered the largest and most important subdiscipline of musicology. Today, historical musicology is one of several large subdisciplines. Historical musicology, ethnomusicology, and systematic musicology are approximately equal in size - if numbers of active participants at international conferences is any guide. Systematic musicology includes music acoustics, the science and technology of acoustical musical instruments, physiology, psychology, sociology, philosophy and computing. Cognitive musicology is the set of phenomena surrounding the computational modeling of music. Unless indicated otherwise, the text in this article is either based on Wikipedia article "Musicology" or another language Wikipedia page thereof used under the terms of the GNU Free Documentation License; or on original research by Jahsonic and friends. See Art and Popular Culture's copyright notice. This page was last modified 18:55, 26 November 2014.